We’d love your help. 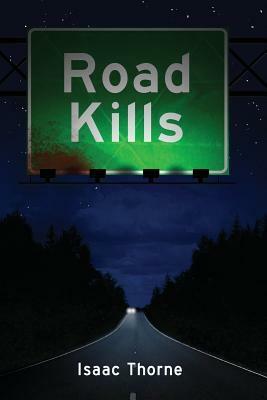 Let us know what’s wrong with this preview of Road Kills by Isaac Thorne. Right now you are safe. You can comfort yourself by reading this book while curled up on your bed or in your f Anyone who has ever fallen off a bike and skinned a knee can tell you that a road is a dangerous place. You can break a bone or crack your skull open barreling down some stretch of interstate at 70 miles-per-hour in a cage of steel, fiberglass, plastic, and rubber. To ask other readers questions about Road Kills, please sign up. Enjoyable short stories. I appreciate the thoroughness and attention to detail in the book itself, as well. A really enjoyable read. Some great short stories from a talented author. 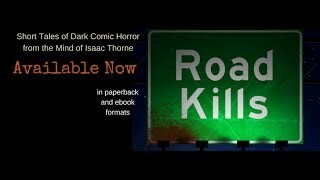 Isaac Thorne’s Road Kills is a collection of finely crafted dark horror tales. The prose is fluid, the writing style is clear and concise, and Thorne uses simile and metaphor skillfully. He’s a fine storyteller and all of the short stories are entertaining. Adroitly weaving in humor and satire, Thorne nonetheless serves up some powerfully sobering themes. One such theme is how the pervasiveness of the monstrous behemoth that is social media has begun to control our lives, strip us of our humanity, and desensitize us to personal tragedy and suffering. In the short story, Dislike, we see strands of the same theme. Stylistically innovative, it’s written as a series of Facebook posts, originating from William Dennison, a troubled man who has just lost his job and his wife in the same day. Bill, as he’s affectionately known by his so-called friends, decides to drown his sorrows in alcohol, vent his drunken frustrations on Facebook, and play with a gun. A recipe for disaster. Some friends are sympathetic to his plight, while others taunt him on, one even liking every single one of his distraught and emotionally charged posts. At least to my mind, there are some powerful messages here. Don’t drunk-Facebook. Don’t let social media run or ruin your life. Don’t get immersed in social media to the point where you lose your identity, people skills, humanity, and compassion. And whatever you do, don’t fall prey to letting social media likes or number of friends or followers, validate your existence or shape your identity. Living through a mirror of social judgment is a landmine-laced freeway to hell. This is a huge problem in our society; so insidious that a new field of psychological study has emerged called FAD—Facebook Addiction Disorder. Now, if you decide to become a psychologist, you can choose to specialize in FAD, a Facebook bad habit akin to alcoholism that has destroyed thousands of lives. My mother once said, “If you don’t have anything good to say, don’t say anything at all.” That axiom can also be applied to social media. Thorne drives that message home in a powerful and compelling fashion. I had the pleasure some time back of reading and reviewing Diggum, a short story by Isaac Thorne about a gravedigger with murderous intent - and promised myself I'd come back for more of his work. Road Kills is a collection of his short stories, neatly ordered with a theme of tales that could take place out on the road, where the flash of headlights up ahead could bring a welcoming face or a dangerous stranger. Some tales are linked - such as the saga of the pretty girl who snaps and goes on a m I had the pleasure some time back of reading and reviewing Diggum, a short story by Isaac Thorne about a gravedigger with murderous intent - and promised myself I'd come back for more of his work. Some tales are linked - such as the saga of the pretty girl who snaps and goes on a murder spree through several of the stories here - others are standalone. Particularly creepy was Bedside Manner, telling the story of a little boy haunted by the literal ghost of his father's past mistakes, full of the cloying fear that comes with a childhood bedroom plunged into darkness and parents absolutely failing to realise that the monster really is in the closet. Hoppers is a revenge tale... about bunnies. For Buffy fans, maybe Anya's fears were well founded. And sometimes the road is less travelled, such as the detour into space for Safety First, a story of first contact about to go horribly, horribly wrong. Diggum reappears here too in two forms, both the original short story and a screenplay version. It's the best of the tales to be found in this collection, still as creepy as the graveyards its words frequent, but Bedside Manner is a strong challenger. Not all tales quite caught me - I wasn't keen on the social media-inspired Dislike, and the trio of stories about the killer girl Tiffany weren't my bag. But that's okay, any short story collection will have tales you love more than others. Sometimes, you catch a single work by a writer and investigating further disappoints - that's far from the case here. I want more. This collection of stories is going to keep you turning the pages. Isaac is great at keeping you submerged in his tales. Isaac Thorne is a nice man who has, over the course of his life, developed a modest ability to spin a good yarn. Really. He promises. He also avoids public men’s restrooms at all costs. He considers himself a lover of books, music, movies, and other forms of pop culture phenomenon. His philosophy on his life is that it's all one giant experiment.